NEW YORK — In a one-two punch in just over a week’s time, Virginia Governor Ralph Northam made inflammatory comments viewed by many as defending infanticide, only days later to have an old yearbook photo surface of him in blackface next to another individual dressed in KKK robes. The pair of controversies sparked cries from Republicans and Democrats urging the governor to resign – calls, which at press time, he had spurned. Northam, a Democrat newly elected last November, first came under fire for comments he made at the end of January regarding proposed legislation that would allow for abortion during the third trimester of pregnancy. “When we talk about third-trimester abortions, these are done with the consent of obviously the mother, with the consent of the physicians, more than one physician, by the way,” Northam said during a radio interview with WTOP. The legislation was eventually tabled in committee and Northam defended his remarks saying he never intended to give sanction to infanticide, however members of both major political parties expressed outrage at the time. 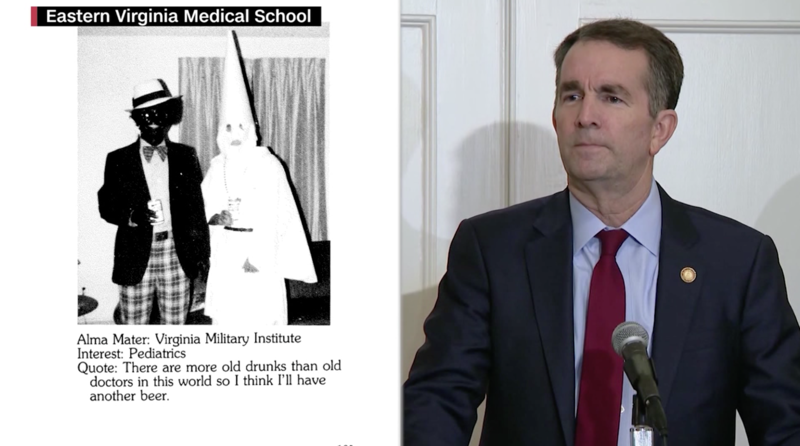 Less than a week later, however, Northam found himself entangled in another controversy when photos surfaced from his medical school yearbook in 1984. While Northam initially acknowledged that he had appeared in the photo and apologized, he later backtracked saying that he had mistaken the incident for another occasion where he donned black shoe polish as a part of a Michael Jackson costume. Since that time, calls for his resignation have come from the highest levels of authority, including President Donald Trump, House Speaker Nancy Pelosi, Hillary Clinton and both of Virginia’s senators. “In recent days, the commonwealth of Virginia has witnessed public officials, including our governor, make callous statements ignoring the dignity of unborn children and jeopardizing the safety and protection of those even in the process of being born,” he said. “Now, with the extremely disturbing photos in Gov. Northam’s medical school yearbook, we see another offense against the dignity of human life – the sin of racism,” he continued. Last fall, the U.S. Conference of Catholic Bishops (USCCB) issued a pastoral letter against racism, where they linked the Church’s fight against racism with its concern for the cause of human life. “The injustice and harm racism causes are an attack on human life. The Church in the United States has spoken out consistently and forcefully against abortion, assisted suicide, euthanasia, the death penalty, and other forms of violence that threaten human life,” the bishops’ wrote. In addition to Northam’s questionable future, the two immediate public officers in line of succession are also under fire, leaving the state to face a nearly unprecedented controversy. Lieutenant Governor Justin Fairfax has become engulfed in scandal following accusations that he sexually assaulted a woman in 2004. Fairfax has rejected calls for his resignation, maintaining that the relations were consensual. On Wednesday, further controversy ensued when the state’s attorney general, Mark Herring, admitted that he once wore blackface at a college party in 1980. Herring is the second in line to succession of the governorship. Should Northam, Fairfax, and Herring all leave office, speaker of the House of Delegates, Kirk Cox, would assume the post.